PORT ST. LUCIE, Fla. — Should students get half credit for an assignment they didn’t even turn in? A former Florida teacher doesn’t think so. That’s why she wrote a goodbye message to her eighth graders on a white board saying, "Bye Kids, Mrs. Tirado loves you and wishes you the best in life! I have been fired for refusing to give you a 50% for not handing anything in. 💓 Mrs. Tirado"
Diane Tirado has been a teacher for years, but she started at West Gate K-8 School in Port St. Lucie, Florida in August as an eighth grade U.S. history teacher. "Teaching is a calling for me," she said. She assigned an explorer notebook project, which she said she gave students two weeks to complete. When several students didn’t turn it in, Tirado found out about what she calls a "no zero" policy, which is reflected in the West Gate student and parent handbook. 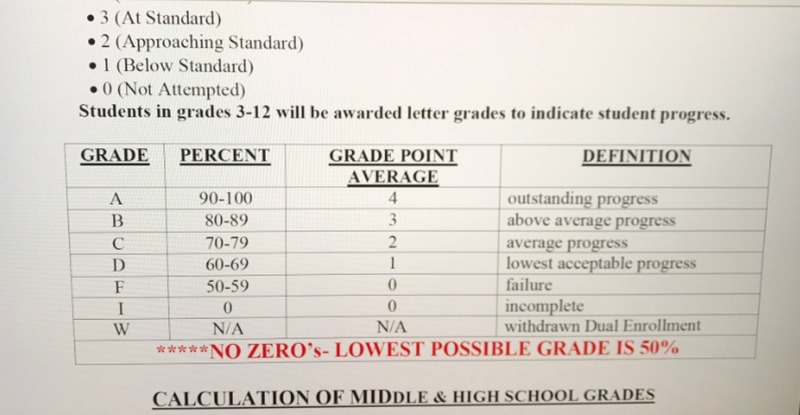 Below the grading rubric, in red lettering, the handbook states "NO ZEROS- LOWEST POSSIBLE GRADE IS 50%"
Tirado was terminated on Sept.14, but there’s no specific cause mentioned in the letter from the principal because she she was still in her probationary period, according to the letter. 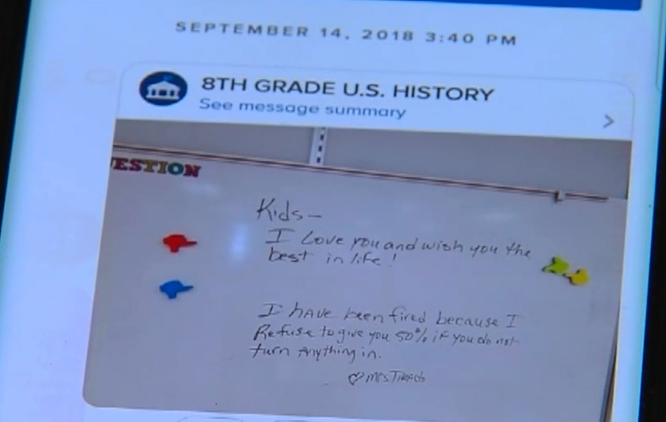 Tirado wrote the message to her students on her whiteboard on her last day before she left and sent out a picture of it through a class app. Several students responded in support. "You were right about not giving people 50s because why would you give them half credit for doing nothing?" wrote one student. Then Tirado posted the shot of the whiteboard on Facebook. Now, it's been shared more than 400 times. “I’m so upset because we have a nation of kids that are expecting to get paid and live their life just for showing up and it’s not real," Tirado said. The principal of West Gate deferred comment to the public information officer with the school district. "Diane Tirado was employed as a teacher for St. Lucie Public Schools (SLPS) from July 30, 2018 to September 14, 2018. She was contracted as a teacher on probationary status, and was terminated shortly after one month of classroom instruction. SLPS values the importance of maintaining a high-quality teaching staff who support students’ individualized learning needs; who understand the value of forming appropriate and positive relationships with students, colleagues, and parents; and who provide accurate and productive feedback to students on assignments. Wavering on the expectations of quality is not an option. There is no District or individual school policy prohibiting teachers from recording a grade of zero for work not turned in. The District’s Uniform Grading System utilizes letter grades A-F, numerical grades 100-0 and grade point averages from 4-0." "Some classroom teachers and school faculties have discussed the range of points for work submitted in each grading category. Tirado said she was instructed never to give a student a zero, as the handbook states, and she hopes she can motivate policy change. “A grade in Mrs. Tirado’s class is earned," Tirado said.